Which came first: The toyline or the cartoon? The KISS principle states that most systems work best whenthey are kept simple and straightforward rather than overly complex. Perhaps this theory has never proven more true than during the 1980s animated toy line boom. Robots that turn into cars and jets, specialized branches of the armed forces fighting a faceless terrorist organization and a barbarian battling an evil wizard with a skeleton face in a world filled with science and sorcery were simple and easy formulas for success. But if a team of scientists utilizing zip-lines in their quest to obtain an unstable new element that can only be found in a new continent with a constantly changing terrain doesn’t sound familiar, then it stands as a testament to the fact that the creators of Sky Commanders could’ve learned a lesson or two from Kelly Johnson’s theory of keeping it simple, stupid. Crashing onto the television screens in 1987, Sky Commanders is a perfect example of the chicken-and-egg method of creating (or attempting to create) popular toy lines spawned by popular cartoons. Or perhaps it’s the other way around? Either way, the series only lasted 13 episodes before going the way of the Sectaurs, Inhumanoids, Dino-Riders, and countless other ideas that sounded great on paper but didn’t really click when brought to life. (For the record, Sectaurs not only sounded great on paper, they were totally awesome in real life! I can not, for the life of me, understand why insect-riding warriors didn’t become a monster success - but that’s a rant for another time.) Reviewing The Complete Animated Series, available through the Warner Archive Manufacture-on-Demand program, it isn’t hard to see why Sky Commanders never really worked. It isn’t that the show is really that much worse than other programs of the era. Okay, yes it is. But it’s not like G.I. Joe or Transformers really hold up under the harsh light of our mid-30s once the rose-colored haze of nostalgia has worn off. Sky Commanders, if nothing else, gets a lot of credit for being truly ambitious and really trying to create something new. But if the countless sequels, remakes, and reboots that Hollywood has seen fit to force down our throats have taught us anything, it’s that people do not want fresh, new ideas; they want things that are comfortable - and dangling from a wire at 50,000 feet while being shot at by lunatics wielding laser pistols is anything but comfortable. And therein lies the problem. It isn’t so much that Sky Commanders is so hideously terrible that it becomes unwatchable. But the show, much like the toy line, is incredibly one-note. To be honest, I couldn’t really tell you much about the plot of any given episode; all I could remember was a bunch of dudes suspended from cables, hanging on for dear life. Each episode was, no pun intended, a 22-minute cliffhanger. These adventurous scientist/cowboy/surfers and their garishly outfitted evil counterparts didn’t really seem to do anything other than just (again, no pun intended) hang around and shoot each other, only to fire a life-saving cable at the last possible minute. But they never really seemed to do anything. Correction: in between their battles for Phaeta-7, the aforementioned dangerous new element, the members of the Sky Commanders found plenty of time to practice their incredibly annoying and insanely stereotypical accents. Like many fine cartoon adventurers, this band of go-getters was made up of specialists from around the world, even though they all sort of sounded like your little brother trying to do a Sean Connery impersonation. 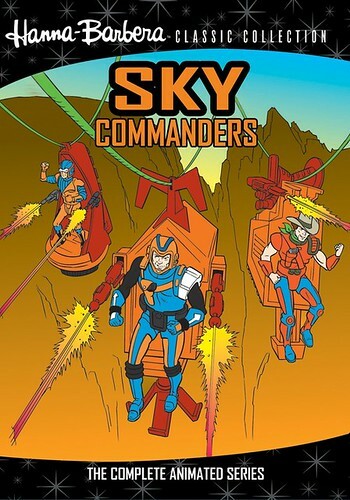 At the end of the day, this two-disc set won’t really appeal to anyone other than the handful of men who were kids when the show aired and spent Christmas of 1987 (and the months afterward) untangling a mess of ropes every time they wanted to have a new adventure with the Sky Commanders. But as my friend Jeremy has pointed out to me again and again, nostalgia trumps all. No matter how terribly unwatchable it is now (or was then), if you fell in love with it when you were 10, you will always find a place in your heart for it. And to those of you who fell in love with Sky Commanders during the latter days of that golden age known as the '80s, your long wait is over. Everyone else should probably just stick to streaming G.I. Joe and Transformers on Netflix. Just be sure to keep those rose colored glasses on.